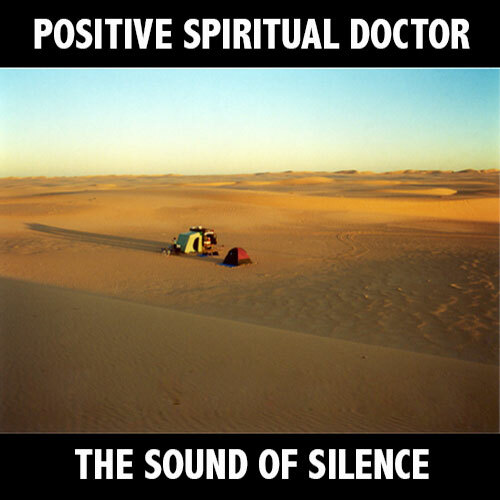 POSITIVE SPIRITUAL DOCTOR - BE STILL AND KNOW THAT I AM GOD - POSITIVE THINKING DOCTOR - DAVID J. ABBOTT M.D. Some people find it odd that Jesus went out in the desert and often spent the night in prayer. Most of us would quickly fall asleep in the same circumstances. For Jesus, the sacred sound of silence was holy ground where he stood in the presence of God. In those quiet times, distractions and attractions disappeared as he listened to God's voice of love. 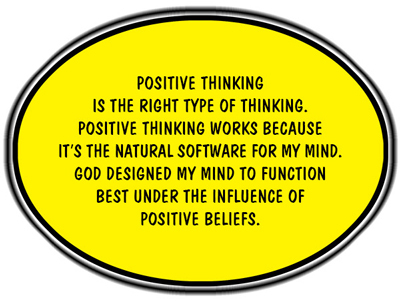 Dr. Dave has written twelve positive thinking eBooks that you need to have in your mind. Send your mind a positive message today. Join Team Maxing Out as they circumnavigate on their catamaran and drive around the world in their Land Rover Defenders. Most people on planet earth have never heard the sound of silence. They have never been in a location that was totally devoid of sound created by humans. If you want a challenge, try to find a place where you can experience total silence without any sound pollution. It's nearly impossible. In this picture, I have set up camp several hundred miles off-road in the Empty Quarter of Arabia. We are far enough into this remote section of desert that most of the vestiges of humanity are absent except for our campsite. After the sun goes down, and you lie on your camp cot, you can sometimes hear the sound of silence. If you hold your breath, you hear absolutely nothing. Total silence. This rare moment doesn't last long because high above your head the faint roar of a distant aircraft pollutes the silence with sound. Now that I am back in "uncivilization" working, there is no silence in my life. No matter where I am, there is noise everywhere. Nearly every day, I hear boom cars thundering out hundreds of decibels of noise polluting my not so silent world. They can thank God that I don't have a Predator drone with a load of Hellfire missiles. I don't know if I could resist the urge to obliterate their megawoofers as they inflict their sonic assault on innocent bystanders. The sonic assault isn't just on the street. Since I came back to "uncivilization", I carry ear plugs to church to protect my ears from the "divine decibles" pulsating from the stage at the front of the auditorium. The music is so loud that I roam through the back of the auditorium trying to find a safe haven where the surround sound can't damage my hearing. Maybe I'm old-fashioned, but I like the sound of silence. The only time I ever feel like I am near God is in those infrequent silent moments that are so hard to find. For me, the only way to hear God's voice of love is to become silent and listen. My cathedral is out in the desert hundreds of miles from "uncivilization" where I can experience total silence. When a bird flies by, it's so quiet that I can hear the flutter of his feathers in the wind. When I'm out there, I'm standing on sacred ground. As night descends on our campsite, I feel like I am in a cathedral that stretches from horizon to horizon. I have a front row seat on eternity as I survey the night sky; many of the stars that I'm looking at died out millions of years ago, but their light is only now reaching our side of the milky way galaxy. In the silence and splendor of the moment, the trivial events of my life fade, and the important things come into focus. And if I listen to the sound of silence, I just might hear God's voice of love. Dr. Dave is the Encourager In Chief of the Positive Thinking Network. He believes there are no limits. There are only limiting beliefs. Dr. Dave is committed to make a positive difference in your life. The wheel of change always turns in the direction of what you put into your mind, and Dr. Dave and the Positive Thinking Network have the resources to turn your life in a positive direction. 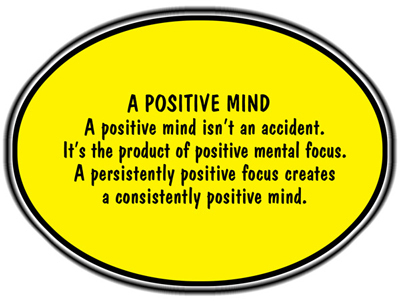 It's time to develop a persistently positive focus so that you can have a consistently positive mind. It's time to change your world. 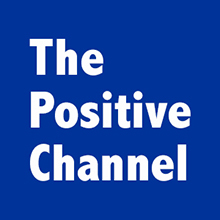 The best place to get your daily dose of positive thinking is The Positive Channel. Positive thoughts are just a click away. This is your opportunity to change the way you think and feel about who you are and what you can do with your life. If you want to change your life, you must first change the way you think. When you change the things you think about, the way you think about things changes. When you change the things you talk about, the way you talk about things changes. Your new life starts today when you start putting positive things into your mind. 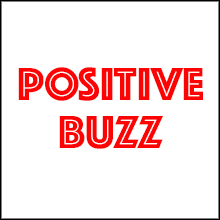 Positive Buzz is your portal to the Positive Thinking Network. It's where you go to get a concentrated dose of all things positive. If you want to explore the world of positive thinking, Positive Buzz is a great place to begin, and you will keep coming back for more. Today is a good day to get a positive buzz going in your mind. 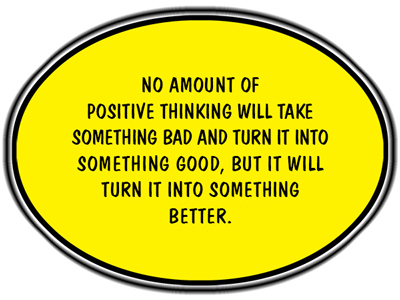 Visit Positive Buzz and get a new way of thinking and feeling. Dr. Dave is also known as Captain Dave of Team Maxing Out. 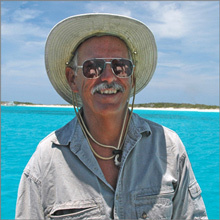 He spent eleven years sailing around the world with his family on their sailboat, Exit Only. They sailed more than 33,000 miles around the world on their Privilege 39 catamaran including a trip through Pirate Alley and up the Red Sea. Dr. Dave drives Land Rover Defenders when land cruising. His Defenders took Team Maxing Out to Arabia, Oman, United Arab Emirates, Mexico, Guatemala, Honduras, Nicaragua, El Salvador, Costa Rica, Panama, New Zealand, and Australia. 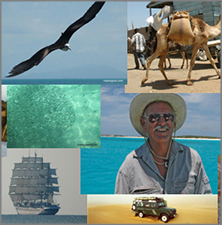 Soon the adventures will continue with a driving trip around the world and a sailing voyage back to Australia. 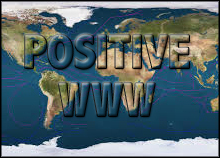 Positive WWW contains a positive website for every country in the world. If you visit all 196 websites, you will make a photographic tour of the world and visit more than a hundred positive destinations. This is the only world tour you will ever take that is totally free. Don't pass up this opportunity to make your life better. It's time to develop a persistently positive focus in order to create a consistently positive mind. 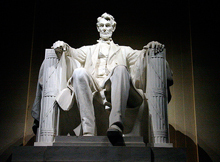 Positive US contains positive websites for every state in the USA. You can visit 50 positive websites that push your life in a positive direction. Tour the USA with your tablet, smartphone, and computer from any place on planet earth. You don't need a passport or a visa to visit Positive US. A few clicks of the mouse and you are on your way to a positive adventure. Rock your world with thousands of pictures and graphics that contain positive captions. The Positive Memes come from hundreds of Dr. Dave's websites. Give your mind a push in a positive drection with Positive Memes from the Positive Thinking Network. 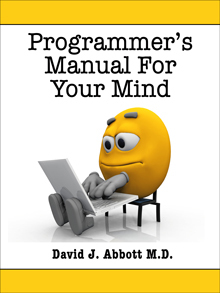 The Programmer’s Manual for Your Mind contains the tools you need to reprogram your mind with a positive operating system. It’s your Personal Tool Kit that shows you how to change the way you think and feel. Your mind is actually being programmed all the time without you being aware that it’s happening. The problem is that someone else is doing the programming. Make no mistake about it. If you don’t program your mind, other people will. Whether you like it or not, you are engaged in mortal mental combat, and your mind is ground zero. If you let your culture, the media, the government, and politicians do the programming, you will be in real trouble. You will not be running your own mind. They will be running it. You will not be living your dreams. You will be living theirs.The Programmer's Manual for Your Mind is now available in ebook format at Amazon, iTunes, Kobo and Barnes and Noble. Start reprogramming your mind today using the tools found in the Programmer’s Manual for Your Mind. Remember, if you want to have a positive mind, nobody can stop you. The Owner's Manual for Your Mind contains thirty-one Change Principles that empower you to make a life. You no longer worship at the altar of security, content to only make a living. The Change Principles show yo how to make a life. Don't timidly tiptoe through life waiting to go for your dreams. You have only one life. The clock is ticking, there are no timeouts, and there is nothing to wait for. Today is the only day you can make your dreams happen. Seize the day. Live as if you are a great person. Renew you mind with positive and empowering thoughts. Achieve excellence in at least one area of your life. Adopt zero tolerance to negative thinking. Don't accept any limitations. Never quit working on your dreams. 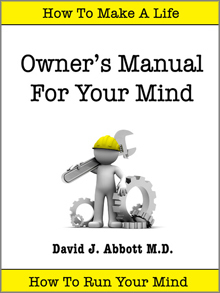 The Owner's Manual for your mind is now available in ebook format at Amazon, iTunes, Kobo and Barnes and Noble. Don't just make a living. Instead make a life using the thirty-one Change Principles found in Owner's Manual for Your Mind. 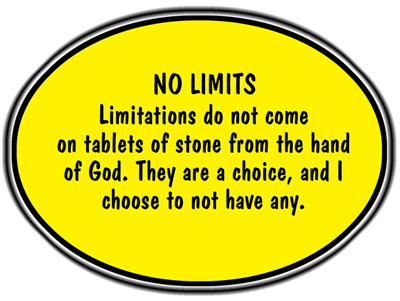 There are no limitations. 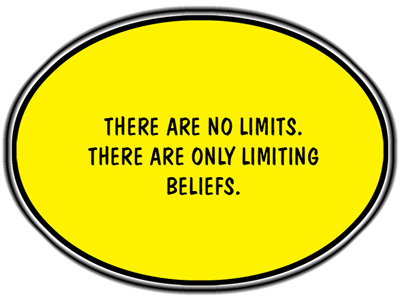 There are only limiting beliefs. Overcoming depression is hard, perhaps the hardest thing you will ever do. But if you want to have a mind free from depression, nobody can stop you. Your emotions are a reflection of your thoughts. When you change your thoughts, your emotions automatically follow. You don't have to battle the negative and twisted emotions echoing in your mind. Instead you need to learn how to change the way you think, and your emotions will naturally take care of themselves. The challenge you face in depression is to change the way you think. If you want to change the way you think and feel, you are going to have to change your inner dialogue. You are going to have to talk to your mind in a different manner. A persistently positive focus creates a consistently positive mind. The battle for a positive mind is fought on the battlefield of focus. In order to break the back of depression, you will have to learn how to persistently and consistently control your mental focus. 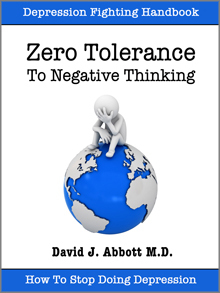 Zero Tolerance to Negative Thinking is now available in ebook format at Amazon, iTunes, Kobo and Barnes and Noble. God is love and works by love. 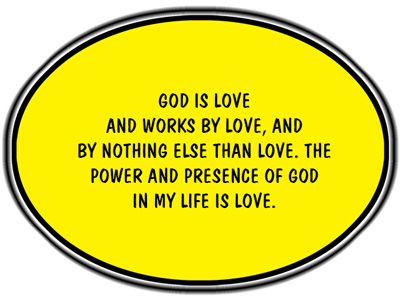 The power and presence of God in my life is love. Every time I see love, I see God's hand at work. Every time I feel love, I experience God's presence and power. When my mind is full of thoughts consistent with God's love, my thoughts are healthy, and my mind is exactly the way God means for it to be. When my heart is full of emotions consistent with God's love, my emotions are healthy, and they are exactly the way God means for them to be. There is no limit to how good my life can become when I open my heart and mind to the power of His love. 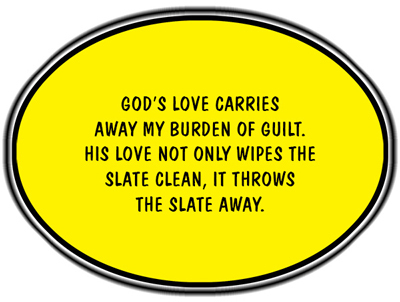 God loves and accepts me the way I am, but He loves me to much to let me stay that way. He loves me from the top of my head to the tip of my toes, and it does not get any better than that. For the rest of my life I will max out on God's love. 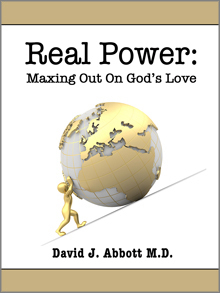 Real Power: Maxing Out on God's Love is now available in ebook format at Amazon, iTunes, Kobo and Barnes and Noble. Too many people have a false model for change. They try to change their life by trying to change their life, and that is the recipe for failure. They are skipping all the steps that make change possible. Big changes don’t involve tweaks. They involve jumps. This book contains quantum self-talk that you need to have in your mind so that you can make a quantum leap to the next level. One hundred Power Graphics make it easy to put positive self-talk into your mind. The power of positive repetition is immense, and when your mind starts repeating quantum self-talk back to you, hang on tight, because you are ready to make a quantum leap to the next level. You have thousands of quantum leaps to make in your life, and quantum self-talk is a great place to start. Happy quantum leaping. 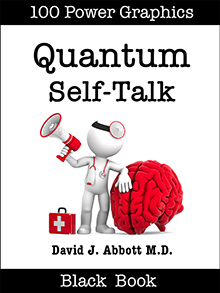 Quantum Self-Talk is now available in ebook format at Amazon, iTunes, Kobo and Barnes and Noble. You can change who you are by changing what you say when you talk to your mind. Just be sure you are speaking a language your mind understands. Your brain speaks to you in its own language, and if you speak to it in the same way, it immediately responds in a powerful fashion. That’s why change proceeds most rapidly when you talk to yourself using the language of the mind. If you don’t speak the language of the mind, you may as well stop talking until you learn it. The three most powerful components of the language of the mind are images, sounds, and emotions. When my brain wants to get my attention, it does not send a text or an email. It blows me away with sights, sounds, and emotions. If you want to get your brain’s attention, you need to do the same thing. Send a message full of sights, sounds, and emotions. Start speaking the language that your mind understands. 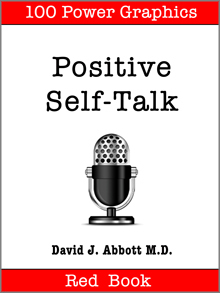 Positive Self-Talk Silver Book is now available in ebook format at Amazon, iTunes, Kobo and Barnes and Noble. Many people believe change is impossible. Most of the time they are confusing personality with personal behavior. The basic human personality is relatively constant over time, but human behavior can and does change. Personal change happens when people change the way they think. I have numerous patients formerly addicted to meth, cocaine, heroine, and alcohol, who escaped their addictions without ever going to rehab for treatment. They simply arrived at a point in their life where they no longer wanted to be prisoners of their addictions. They had experienced enough misery to last ten lifetimes, and they said no more. They changed their belief about who they are and what they can do with their life, and they became a different person who was chemical free. I am grateful to those patients, because they proved beyond a shadow of a doubt that people in the worst circumstances can and do change. Because of them, I am committed to helping people change their lives one belief at a time using positve self-talk. 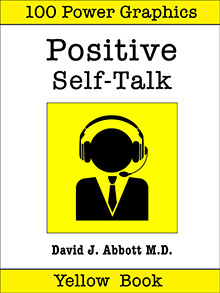 Positive Self-Talk Yellow Book is now available in ebook format at Amazon, iTunes, Kobo and Barnes and Noble. Mark Twain wrote, “Life does not consist mainly, or even largely, of facts or happenings. It consists mainly of the storm of thoughts that is forever blowing though one’s head.” Mark Twain was right. Life consists mainly of the storm of thoughts that blow through your mind. The events of life can be trivial, tragic, and even monumental in nature, but the events themselves have little power. It’s the storm of thoughts about those events that controls our lives. Surviving the storm of thoughts is how we spend most of our time. No matter what we do, the storm still blows, and to a significant degree shapes our lives. Surviving the storm is something we do every day all day long. An entourage of thoughts accompanies each event in our lives. Those thoughts can be positive, negative, or most likely, something in between. Those thoughts are the battleground where we come to our agreement with life. Those thoughts define who we are and what we can do. You need to learn how to control the storm of thoughts blowing through your mind. Positive Self-Talk Gold Book is now available in ebook format at Amazon, iTunes, Kobo and Barnes and Noble. Maximum Strength Positive Thinking tells you what to say when you talk to your mind, and what to say when your mind talks to you. You have a lot of things to discuss with your mind, and Maximum Strength Positive Thinking tells you what you should be talking about. You don't need to spend years searching for empowering ideas that make it possible to live your dreams. It's already right here in a self-talk format. The Law of Positive Self-Talk states, "You can change who you are by changing what you say when you talk to your mind." If you don't like what you hear when your mind talks to you, you have the power to change the message. Although the wheel of change turns slowly, it always turns in the direction of what you put into your mind. When you fill your mind with positive self-talk and more than one-hundred Power Graphics, your life improves by leaps and bounds. 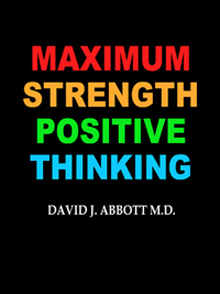 Maximum Strength Positive Thinking is now available in eBook Format at Amazon, iTunes, Kobo and Barnes and Noble. Make your life better today by putting Maximum Strength Positive Thinking into your mind. Positive Christian Self-Talk is as much about God as it is about you. 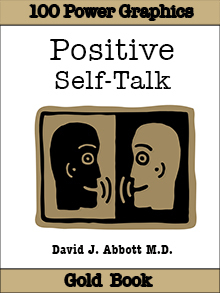 The self-talk contained in this book is designed to change your life. You learn to think the way that God thinks and speak the way that God speaks so that your self-talk has real power. It's time to get in agreement with God about who you are and what you can do with your life. It's time to speak your new life into existence. Jesus said, "As you believe, so shall it be done unto you." Jesus was talking about positive expectations. You don't get what you want, you get what you expect. It doesn't matter if your expectations are positive or negative, you still get what you expect. If you want positive self-talk to work in your life, all of your self-talk must be forged in the fires of positive expectations. It's time to jump into God's ocean of love and have a life changing experience. Positive Christian Self-Talk points your life in the right direction and gives you the power to make the trip. 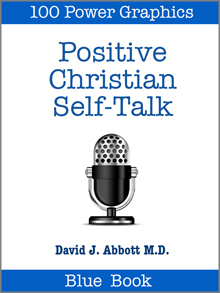 Positive Christian Self-Talk is now available in ebook format at Amazon, iTunes, Kobo and Barnes and Noble. Living small serves no great purpose. Living as if you are a great person is a powerful idea that changes lives, and those who take it seriously change their world. Living as if you are great means you live as if your dreams are possible and work each day to make them happen. You act as if you cannot fail. In order to live as if you are great, you have to think the way great people think, talk the way great people talk, and act the way great people act. Great people think, talk, and act their dreams into existence. 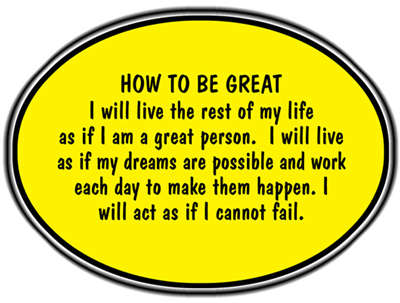 If you ever become great, it will be because you think great thoughts, repeat great self-talk, have great expectations, and act as if you cannot fail. Some people wrongly believe that change is impossible. Leopards don't change their spots, and zebra stripes are forever. But people are different. People change their stars. They change their stripes, and their spots disappear in an instant of time. That instant happens the moment they develop positive expectations and believe they have the power to change. Positive self-talk and positive expectations can take you anywhere you want to go. Positive Self-Talk Purple Book is now available in ebook format at Amazon, iTunes, Kobo and Barnes and Noble. A persistently positive focus creates a consistently positive mind. The same is true of your self-talk. It must be persistent, positive, and specific to have maximum impact. Lack of persistentce has laid more dreams to rest in the cemetery of failure than any other cause. There is zero chance that you will succeed on your first attempt. If your dreams are great, You will fail again and again on your way to the top. Before you can be great, you have to be good. Before you can be good, you have to be bad. Before you can be bad, you have to try. Millions of people stop at try. Thousands get stuck at bad. Hundreds quit at good. A few go all the way to great. If you don't have persistence, you willl never make the trip from try to bad to good to great. Positive Self-Talk Red Book helps you develop a persistently positive focus so that you can develop a consistently positive mind. More than one-hundred Power Graphics contain powerful thoughts that you need to have in your mind. 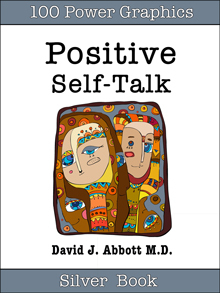 Positive Self-Talk Red Book is now available at Amazon, iTunes, Kobo and Barnes and Noble. Although I like the feel of a paper book in my hand, I love trees even more. 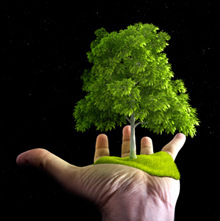 When people purchase an eBook, they actually save trees and save money as well. Ebooks are less expensive and have no negative impact on the environment. All of Dr. Dave's books are available at Save A Tree Bookstore. Visit the bookstore today and start putting good things into your mind. It's easy to fill your mind with positive things using eBooks. No matter where you are or what you are doing, you can pull out your smart phone or tablet and start reading. You can even use electronic highlighters and make annotations in your eBooks just like paper books.